My name is Robert David Cummings and I am the Coordinator for Phillips County. If you would like to contribute your information to this page, please let me know. Are you interested in hosting one of the KsGenWeb orphan counties? If so contact Debbie Wafford. Debbie is our Orphan County Coordinator and will be glad to answer your questions. Information about the responsiblities of a county host can be found by clicking here. Please post your Phillips County records! Any records that you can contribute will be of great value to other researchers. Old Fort Bissell Stockade Phillips County Historical Society Inc., U.S. Highway 36 , at the Phillipsburg City Park, Phillipsburg, KS 67661, (785) 543-6212 Open May 01 thru September, closed on Sundays and Mondays and July 4th, open Tuesday - Saturday 10 a.m. - Noon and 2 - 6 p.m. , Closed for season Sept 30. Group tours available during season & by appointment during off season. Free Admission; however, donations are accepted. Phillips County Convention & Visitors Bureau Great information for visiting researchers! Phillipsburg City Library 888 Fourth Street, Phillipsburg, KS 67661. (785)543-5325 Open Monday - Friday 10 a.m. - 6 p.m.; Saturday 10 a.m. - 4 p.m.
Phillips County Genealogical Society P.O. Box 114, Phillipsburg, KS 67661-0114 . McCord and Allied Families of Phillips County, Kansas. MADISON, McCLAIN, GEARHEART Families of Phillips County, Kansas. If you have a home page that has Phillips County connections we will be glad to provide a link to it. 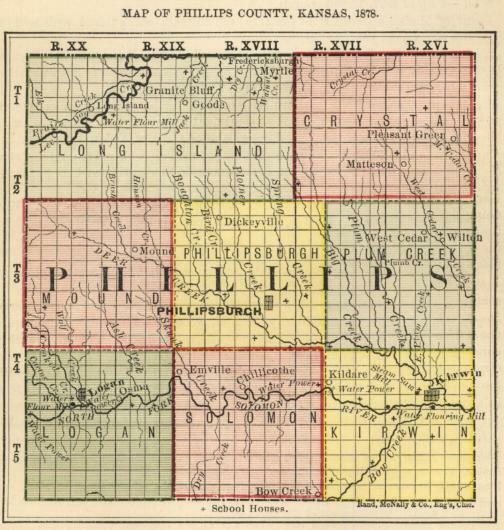 1880 Federal Census and 1885 KS State Census Lookups for Phillips County! Where In Kansas Is ....? Find present day and extinct Kansas towns. Archaic Medical Terms Excellent resource to find the meaning of old medical terms.